Custom built bookcases have the ability to transform any room. Whether it’s an office, study or living room, our custom bookcases are designed to suit your style and your room perfectly. At A-K Custom Interiors, we specialize in turning our client’s dreams into reality. Take a look at some of our recent projects and see how we can help you add style and storage to your home. 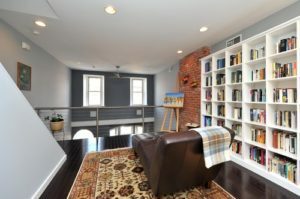 We loved building these rounded bookcases for this two-story study. 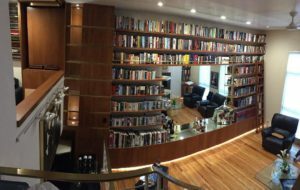 These custom built bookcases provide so much storage and make a large room appear even bigger, as the shelves draw your eyes to the ceiling. And, the large mirror in the center keeps the wall from looking too cluttered by providing some visual space. Lastly, the rolling library ladder adds a ton of charm and functionality to this personal library. Take a look at more of our custom work in our portfolio. This gorgeous space was originally an oversized landing in a lovely modern home. To make it stand out, we installed classic wall-to-wall bookcases. The bright white shelves are nicely juxtaposed against the exposed brick chimney and the dark hardwood floors. Because these are custom built bookcases, we were able to make them the exact height to allow for the heating and cooling vents to be unobstructed. If you’d like to see more projects like this, take a look at our work on Houzz. 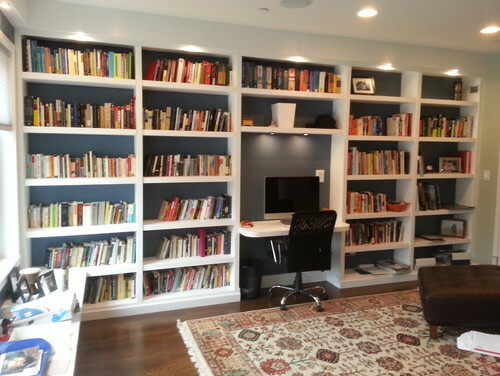 For this home office, we installed custom built bookcases and a workstation which added a ton of style and utility. 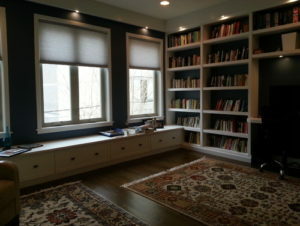 The shelves are perfectly sized to hold our client’s books without affecting the window trim in the corner. Then, under the wall of windows, we built a long sitting bench that also acts as great hidden storage. Pull-out drawers across the length of the wall provide tons of space to store infrequently used items. 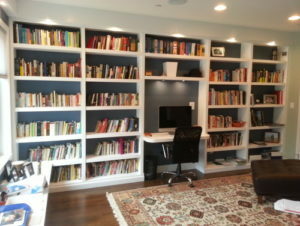 Lastly, the recessed lighting above each bookcase and workstation provides both great task lighting and a little drama. If you’re ready to renovate, let A-K Custom Interiors help. With 10 years of experience and expertise in finish work and carpentry, we make your design dreams a reality. Give us a call 215-839-6659 at or fill out our contact form to schedule a complimentary consultation today. Next post: From Initial Design to Finish Carpentry, Philadelphia’s A-K Customs Does it All!